Meet some of the many wonderful Ferrets of HFF! [Male, Albino, Intact, from Misty Mountain Ferrets] A new addition to the family, the world welcomed Zero in June, 2017 and our family welcomed him in August, 2017. He is a vibrant a spunky ferret who is constantly finding new ways to cause trouble. He loves trying to swim in the toilet, and his energy knows no bounds. Zero will play until he drops. He packs an attitude almost as big as his appetite, but after he has worn himself out playing he is happy to relax in our arms for massages and snuggles. 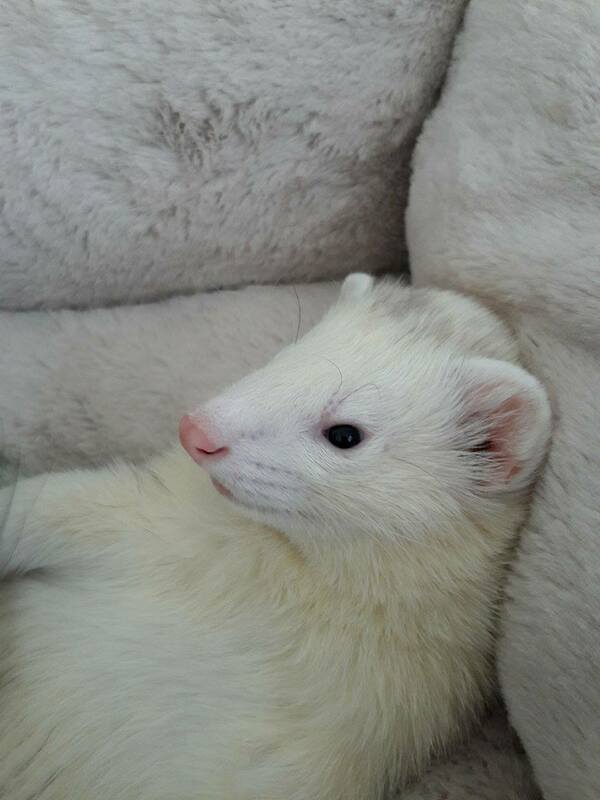 [Male, Albino, Intact, from Misty Mountain Ferrets] A new addition to the family, the world welcomed Juuzou in June, 2017 and our family welcomed him in August, 2017. He is incredibly sweet-natured and loves to snuggle, but gives his brother Zero a run for his money in the mischief department. He will chase teaser toys almost without end, loves his Wonkies, and prefers to snorkel with 90% of his body in the water. 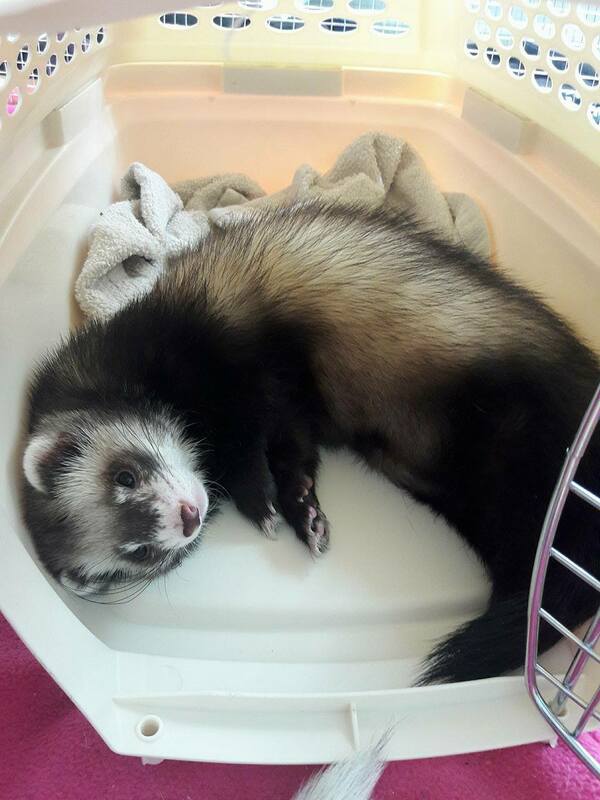 Juuzou adores snuggling up for massages, and has become known in our house for his “loose poofer” – releasing a potent cloud of ferrety musk when he naps in your lap. (Male, Silver, Marshalls- Deaf) Croc is most definitely my husbands boy. Don’t get me wrong, he loves me, but he ADORES my husband. He is deaf, and takes a while to learn things. We brought him home a week after Gator and they are best friends (he was the only one in the cage that interacted with us through the glass. He basically asked to come home with us). I often find them cuddling together. Croc has been my training challenge. 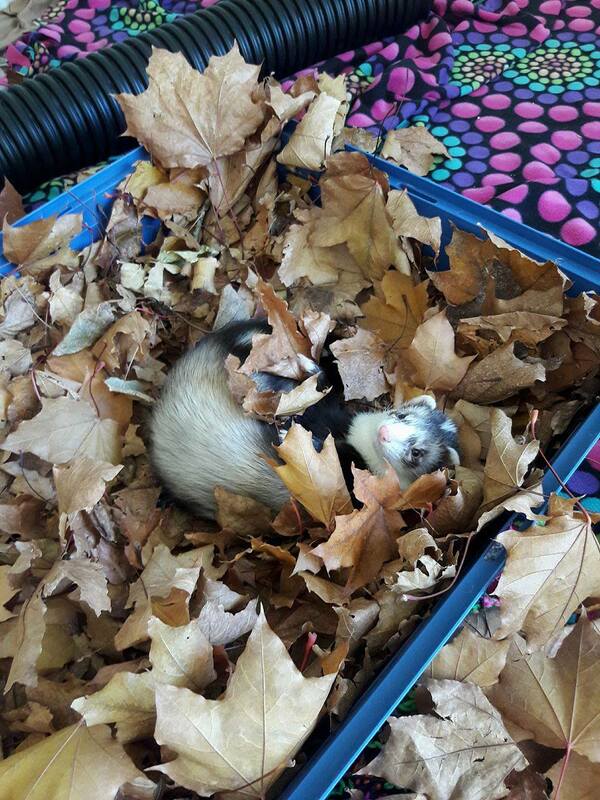 He would not use the litter box (he would rather dig it out of the corner, then poop next to it) and he nipped a ton (common with deaf ferrets), especially feet under blankets. It took trying many different things with him, and listening to him, to come to the understanding him and I have. I’m lucky to have such an understanding little boy that has been so patient with me. He is my softy. Croc loves to explore, tunnel under blankets, to be chased after, tickled, then lightly tossed on the bed, and running at you as fast as possible only to veer off in another direction. I’d have to say his favorite food is duck. (Female, Blaze, Marshalls- Deaf) Oh Cow, we found this little girl in a pet store out of town. She was alone in a tall cage with no levels, and only a few pages of newspaper. I found her sleeping under a page, she was just a tiny grey ball of fur. When I picked her up all she did was bite and scratch me, she did the same to my husband. He ended up suggesting we put her on the ground to see what she would do (proud wife moment), and lo and behold that tiny ball of bones and fur began to dance. She danced up to us and investigated our hands. Needless to say, we brought her home that day. She is my my stubborn, independent, energetic, food stealing (Seriously, it’s her favorite game) gorgeous little princess, and she knows it too! This girly LOVES tubes and goes absolutely crazy if you toss socks at her. She also loves sliding plastic easter eggs around, carrying them, and she has managed to figure out how to shoot them straight up in the air and catch them. She just likes food in general, and stashing it.